Situated just off Bank Street at 2079 Bank Place across from South Keys Shopping Centre, see paintings celebrating the wonderful colours of the spring and summer seasons. Watch for new work coming later in the fall. 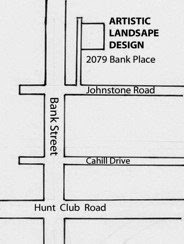 Artistic Landscape Design’s Boutique & Art Gallery are open until December.